The circumstances in which a child grows up has a huge impact on their life outcomes—and the gap is not narrowing. If anything, multiple scholars suggest that background conditions are now more important than ever. Education can give a hand-up on the ladder of social opportunity to economically disadvantaged kids, whether it’s being able to watch Sesame Street or making it into a local 4-year college. Of course, higher education seems out of reach for many students, as the price of college—even after financial aid—continues to rise. The Kalamazoo Promise and many other similar place-based programs have sprung up in communities that face persistent challenges of poverty, inequality, and relatively low educational attainment. Can such programs, generous as Kalamazoo’s, mitigate the gaps in educational outcomes between impoverished students and their more fortunate peers? It is all the more remarkable that these gains occurred as the economy, both nationally and in Kalamazoo, fell into the worst recession since the Great Depression. Of course, what researchers, educators, policymakers, and families really care about is not just enrollment rates, but completion rates. Are these students actually getting a degree? In a new paper, my colleagues at the Upjohn Institute for Employment Research, Tim Bartik and Marta Lachowska and I find that the Promise not only boosted enrollment rates, but also increased completion rates. 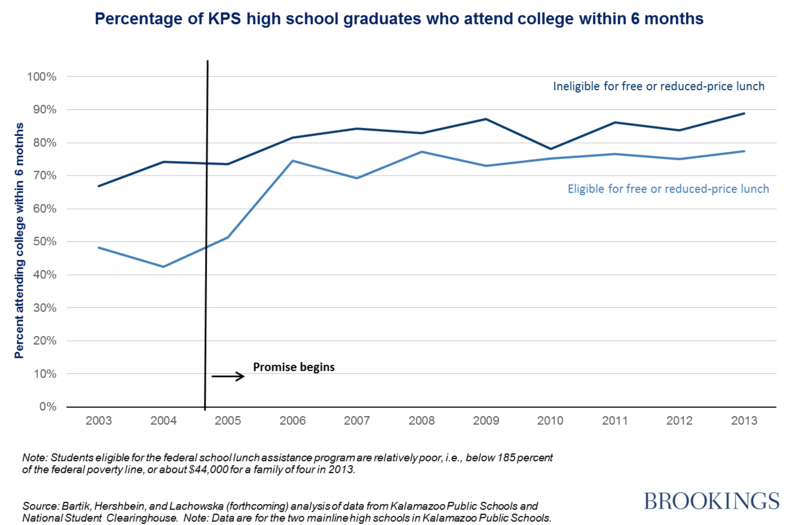 Specifically, the share of Promise-eligible high school grads earning a bachelor’s degree within six years rose from 30 percent to 37 percent, and this jump happened for both students who qualified for assisted lunch and those who did not. Of course this means there is plenty of room for further improvement, as Timothy Ready’s blog in this series points out. We need to know more about other interventions that can help leverage the Promise. That’s why it is crucial to note that Promise programs are not just about college scholarships; they are also about changing the culture of expectations and motivating students by bringing college within reach. Our work is part of a broader consortium developing a common framework for examining the effects of Promise programs and how differences among them—for example, whether they’re open to all students, impose academic requirements or limit the types of colleges covered—matter when it comes to educational outcomes. In short: watch this space.